Last Tuesday, we has a "First" at our house. It was the very "FIRST" time we have ever had an early release day at our school!! So, what did we do to celebrate Sarah and Andrew getting out of school early for the day? We let everyone choose something they wanted to do. Benjamin wanted to play Wii (that wasn't a surprise), Sarah wanted to read out loud from "Bedtime Stories" (we have to read it before we can see it), Andrew wanted to watch The Biggest Loser (the kids and I are totally "into" the show) and Spencer wanted to make a cake. I had seen a fun idea on one of our favorite entertaining blogs "No Fuss Fabulous" and so we tried it! What a fun "First" for us!! 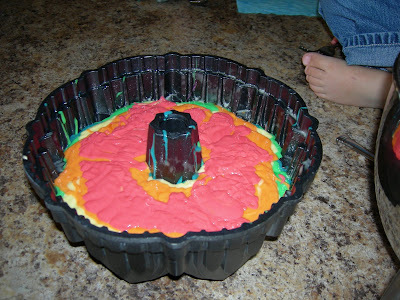 Before we cooked the cake. 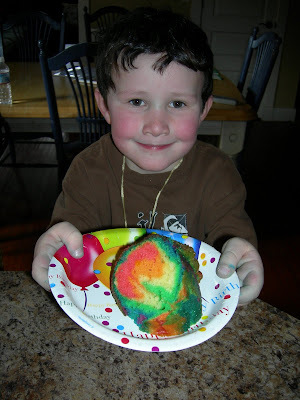 We all thought it looked "tie dyed" after baking it. 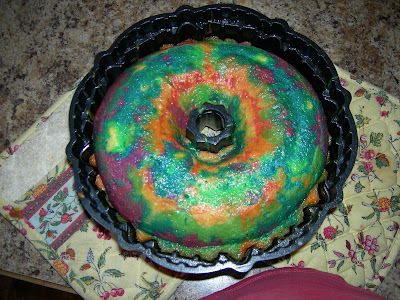 We thought the rainbow cake turned out super cool!! PS. I'm SO jealous. Nathan is in Dallas for a few days this week and actually gets to meet the famous Loralee who's amazing blog is No Fuss Fabulous!!!! 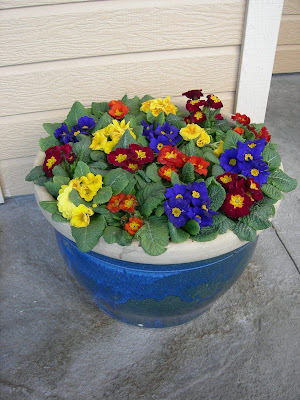 A couple of weekends ago, Nathan planted two planters with primrose by our front door. I LOVE seeing them and just know that Spring is right around the corner! !